One of the closest marinas to Catalina! 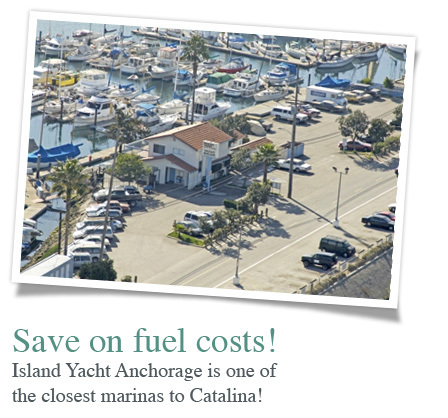 Island Yacht Anchorage, Inc. operates marina locations in the Los Angeles and Long Beach Harbors. With a total of 214 slips, both marina locations are just minutes to the open ocean. Slip sizes range from 25 to 55 feet with end ties as large as 122 feet. Live aboard slips are available. Island Yacht Anchorage offers controlled access, restrooms and shower facilities, laundry, dock boxes, water and electrical connection dockside. Restaurants, chandlery, fuel docks and pump out stations are only a short distant away. Take the 405 South to the 110 South. Exit at Anaheim Street. Make a left at the off-ramp followed by another left onto Anaheim Street. Make a right on Henry Ford Avenue. Make a right at your first light (South Henry Ford), Make a right at the stop sign (Anchorage Rd.). Island Yacht Anchorage is the first building located on the left side. Take the 405 North to the 710 South. Exit right onto Anaheim Street West. Make a left on Henry Ford Avenue. Make a right at your first light (South Henry Ford). Make a right at the stop sign (Anchorage Rd.). Island Yacht Anchorage is the first building located on the left side. Liveaboard positions must be approved by the marina management. The vessel must be at least 30 feet in length and must be equipped with an approved Operational Head with Holding Tank. All Liveaboard vessels must provide a monthly sewage disposal report to the management office. Slip Fees are based on boat length or slip length, whichever is greater. The overall length of any vessel is defined as the distance from the most forward point of the vessel to the furthest position aft. 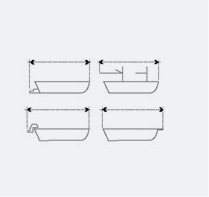 This includes all items such as pulpits, anchors, anchor rollers, davits, swim steps, etc.